There are a lot of movies that try to capture what it feels like to be in high school - both good and bad. 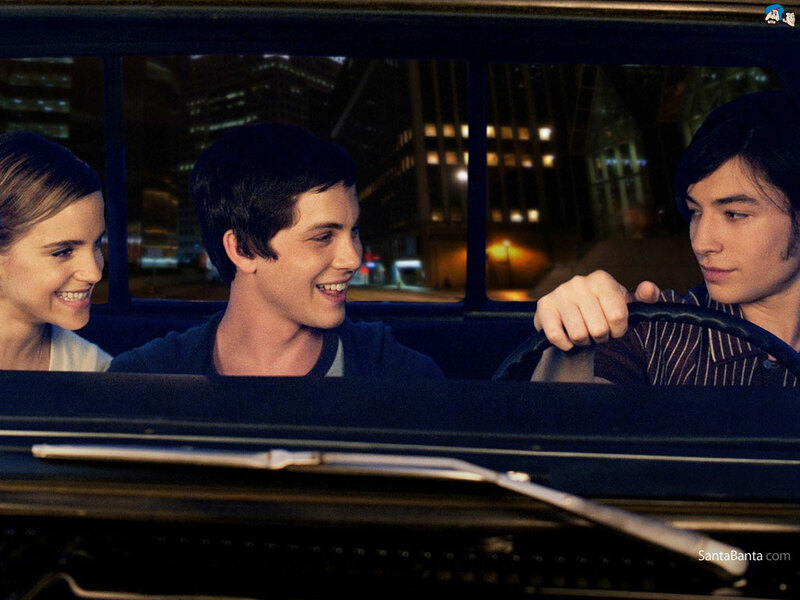 For me, one of the films that comes closest to capturing the overall experience of high school is The Perks of Being a Wallflower. I would hardly say I was a wallflower, but I was in turn shy and bitchy, was friends mostly with people outside of my own grade (both older and younger), and definitely wasn't part of the popular crowd. Thankfully, I went to a small school where I'd been with the same 80 people since kindergarten, so I still really enjoyed high school. Our hero, Charlie (Logan Lerman), is introduced with quite a back story that we don't learn about until he's baked at a party one night. He's about to start high school and doesn't have any friends and is having trouble fitting in. Thankfully, he meets Patrick (Ezra Miller), an off-the-wall senior in Charlie's freshmen shop class. One day at a football game, Charlie actually says hi to Patrick and meets his step-sister Sam (Emma Watson) and she brings Charlie into their social group of "misfit toys". He gets to date, make friends, learn about all kinds of things, and begin to heal from all the baggage he brought with him. He definitely falls a little in love with Sam, but of course that can't work out right away. I was amazed at how much I liked Ezra Miller and Emma Watson in this - it speaks well of their acting ability that very quickly I'd completely forgotten about Kevin and Hermione, respectively. From this description, it might be hard to see why this movie is amazing, but you'll have to just believe that to me, it was. I can see if you have a different kind of background or your high school experience was particularly good or bad, this movie might not make much sense to you or you might not like it much, but for me this was really able to grab some of the best and truest pieces of high school - how it feels, all day every day, and is never the same and everything feels larger than life and you have an ability to live through it, and at the same time you're really sure that everyone will figure out you're a fraud. The ability of film to capture a feeling that complicated is rare. I agree--this movie captures high school life brilliantly. I absolutely loved it. But I agree that if you didn't have this kind of background/experience (i.e. you were popular), this film will be completely lost on you. I really enjoyed it, but I can see if high school was a long time ago, or you had a different kind of experience, it might not land. I had the whole friends in other grades and everything.